Thank you for stopping by my blog (Kayla MacAulay), from Tasmania Australia. 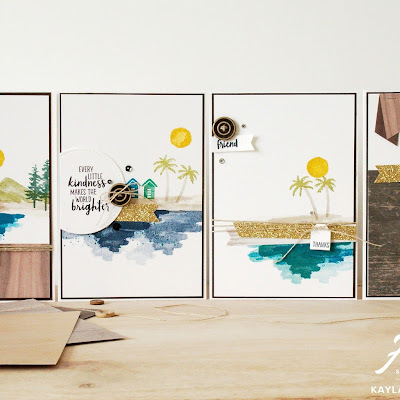 Welcome to my very first blog hop with Stamping Sunday...the great blog hop hosted by the lovely ever so talented Sara Levin! I am so thrilled to be part of this hop with a bunch of talented and amazing crafters from all over the world. I can't wait to share my projects for today using the ever so amazing STAMPARATUS tool. This tool really has been amazing and has changed the way I stamp! I love the amazing possibilities that is provides for some absolutely amazing techniques. It really is a 'must have' for every crafter and should be a staple on your desk. It really sets itself apart from all other stamping positioning tools on the market because it has TWO removable plates meaning you have FOUR sides to work with and can use it for both photopolymer and red rubber stamps! It is a nice size to work with, has grid plates that won't wear with cleaning. I can't stop boasting about it! I really wanted to go back to basics with today's post and talk about what it does best and that is stamp positioning, so I set to work with one of the amazing new host sets from the new catalogue which is called Hand Delivered. 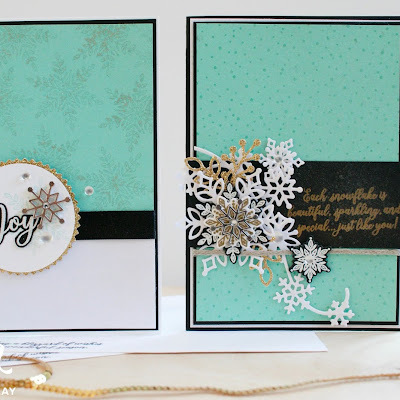 This set is a great example because it has a lot of two step stamping involved. I created one card with the lady holding balloons and the other holding a sign. Sometimes these types of stamps can be tricky to line up, but with the help of the Stamparatus, it is a breeze! It also means that if it doesn't stamp quite right the first time, it's easy to just ink up and stamp again for a perfect impression! Doesn't get much better than that! I think some are already back in stock! It is important when using the Stampin' Blends to ensure you are stamping with the Memento Black ink to ensure that it does not smear or smudge the stamped image due to the alcohol content in the markers. 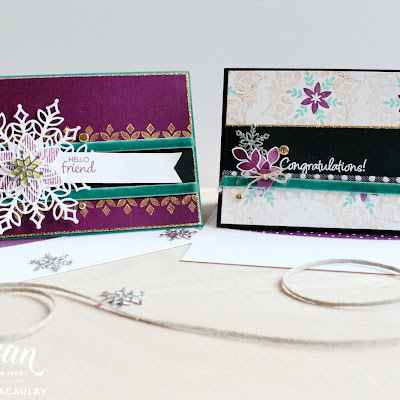 Here's a closer look at the Hand Delivered stamp set that I used for these cards and so you can see why the Stamparatus is such a handy tool to use when stamping these! I love that you can stamp a lady for a birthday, thank you, congratulations, graduation, sympathy or get well card! There are so many things you can do with this stamp set! Better still you can earn this for FREE or for a discounted price as a special 'host only' stamp set simply by placing a workshop order or hosting a workshop (online or in person) with friends or by placing an order of $250 Australian Dollars or more. Ask me how! Here's another picture of the finished cards. I didn't use the Stamparatus to stamp those little flowers, instead used an 'A' sized clear block and stamped them towards the end as I had to stamp them multiple times. 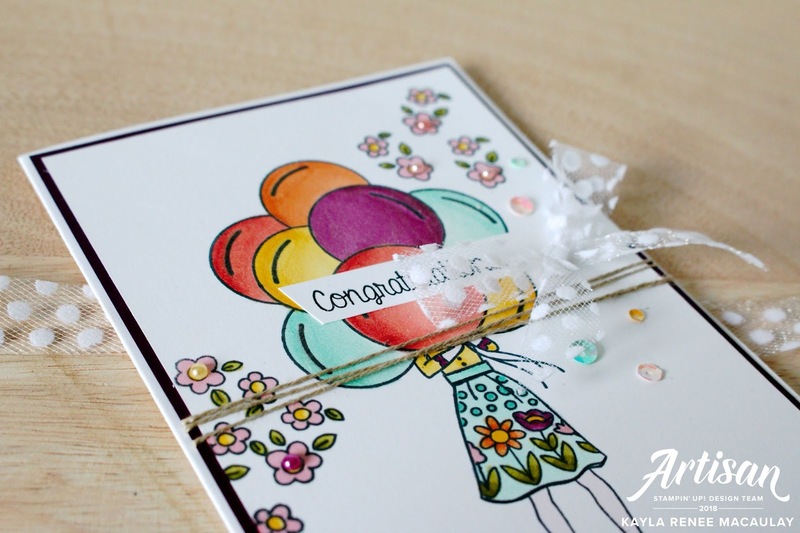 I then accented the cards with a mixture of Sequins, Linen Thread, some new ribbons, Wink of Stella and some of the beautiful new Share What You Love Artisan Pearls. They look so cute in the flower centres. I must admit I am little addicted to the soft texture of the beautiful new tulle spotty ribbon! It ties such beautiful bows also! This one ended up being my favourite and I must admit I just love sending thank you cards because in this beautiful crating community I have so many people I can thank. The picture doesn't really do the card justice as I have added lots of fun Wink of Stella accents to the skirt and it really makes it shine! This one is super fun and I can't wait to send this to someone as a Congrats card. I mixed up the layout of this one a little, tying the Linen Thread around the centre and accenting with a tulle bow. 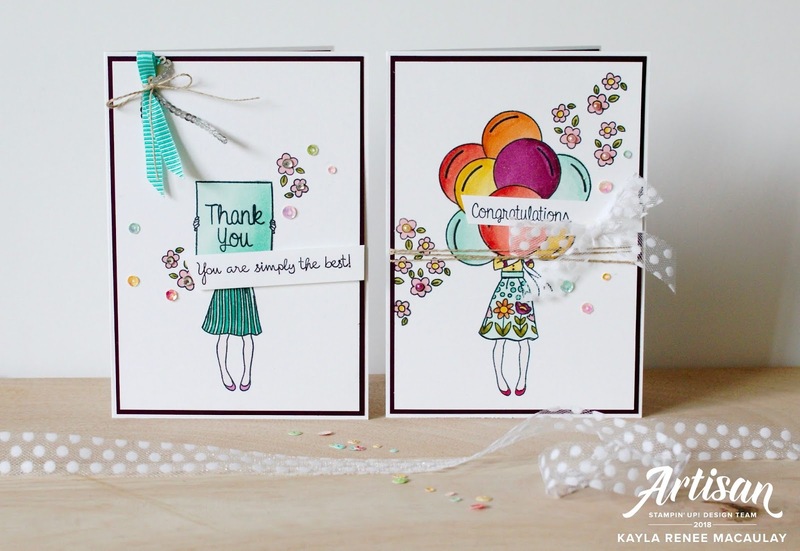 I had the time of my life colouring with the Stampin' Blends on this one, it's so relaxing! I hope you enjoyed my projects today and found some inspiration. The Stamparatus is really a gem of a tool and makes stamping precisely and perfectly so easy! It's well worth the investment, you won't regret it - I promise! For more inspiration please do go check out the blogs of all the other gorgeous people that took part. There are some amazing projects all using the Stamparatus to inspire you! Thanks for stopping by!